[MUSIC] Before trying out CS First as a student, let’s walk through the curriculum. CS First has introductory-level sample activities that can each be completed in about an hour. They can be easily integrated into your lesson plans and are a great way to introduce your students to coding. Once you’ve tried a sample activity, you may want to dive into a CS First theme such as Storytelling, a beginner theme, or Game Design, a more advanced theme. CS First themes are made up of eight activities, which are like mini-lessons or units. Each theme is interest based, varies in complexity, from beginner to advanced, and can last several days or weeks. Let’s take a closer look at the Storytelling theme. This is a beginner theme with 10 hours of content. It provides a great way to introduce students to computer science concepts and highlights ELA concepts such as setting, premise, characterization, and dialogue. 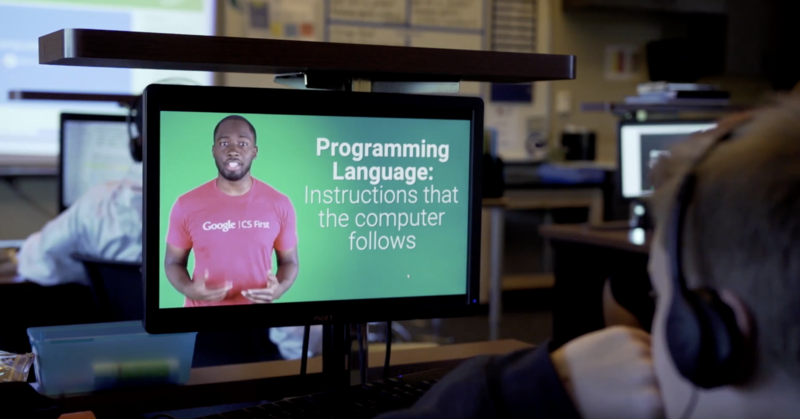 The CS First curriculum was built by Google computer science experts and experienced teachers with the teachers’ needs in mind. Teachers can easily customize the sample activities and themes across multiple disciplines and a variety of learning environments. CS First creates an environment for peer-learning and creative problem solving through coding. Students naturally turn to each other for help or to offer ideas and become each other’s teachers! As students progress through the curriculum, they experience the core values of CS First which are: courage to try new things, confidence in using technology, perseverance when facing challenges, impact on community and careers, and a sense of belonging in technology. Move on to the next video in the Getting Started with CS First series. In this video, you'll review the CS First curriculum and gain a better understanding on how to use sample activities or themes in a variety of learning environments. Follow along with the "Getting Started with CS First" video series using the companion presentation below.